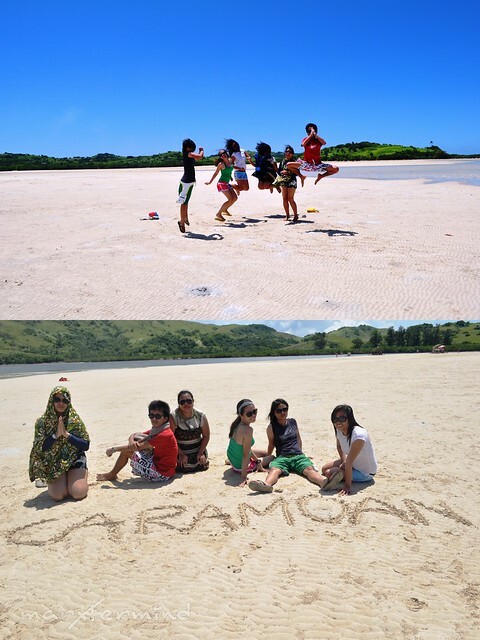 I lived in Camarines Sur for 3 years when I was still a kid but I’d never heard of Caramoan until Survivor came. Camarimes Sur should be thankful to Survivor as it has given Caramoan the fame and stand of one of the prime destination in the country. I have seen how Cam Sur rises in terms of tourism. Naga City, which is part of Camarines Sur, has been known for Peñafrancia Festival. As time flies, the region evolves from building the first SM in Bicol Region in Naga City, the impressive Cam Sur Watersports Complex in Pili and the boost of Caramoan Peninsula. These are just few places to visit in Cam Sur, and I know there are still great places to explore (and I hope to keep as is) in the region. Since the first jeepney trip from our town to Pili is still at 6:00 AM, me and my friends slept over at our relatives house in Bula Centro. At 4:00 AM, we hired a tricycle that took us to Crossing Anayan (near Pili Centro). If you’re coming from Naga, I believe there are public vans going to Sabang Beach / port. At 5:00 AM, we arrived and waited for jeepney going to Sabang Beach. We waited for so long before the first jeepney came. Travel time is about 1 1/2 hour going to Sabang, and the fare costs PHP 70.00. As soon as we arrived at Sabang port, we paid PHP 10.00 for the floater (wala na yung buhat-buhat or papasanin sa likod) to take you to the ferry / motor boat. Tip: Sit at the left side of the ferry / motorboat for full view of the green mountains, right side is a view of the blue sea with Mt. Mayon from afar. Moving on, the sea was calm, it was indeed my calmest boat ride I ever had. According to the captain, the sea waves are notorious during October. Moving on, from port we hired a tricycle that took us to our accommodation. I contacted Rex Tourist Inn but I had never got a text message again from their last reply so I gave it up and just go wherever our guide lead us. From Guijalo port, it took us about 30 minutes (with PHP 20.00 each fare) until we reached our accommodation. It wasn’t commercialized yet and it was behind the owner / family’s house. The room with private toilet costs PHP 1,800.00 and ofcourse we haggled. I left it with my aunts since they can speak Bicolano fluently (mas madaling makipagusap). So we got the room at PHP 1,500 for the six of us. After we’re done eating and had our things fixed, we’re ready to go and explore the islands of Caramoan. Our tricycle driver came and took us to Bikal port along with our guide. From Centro, it took us about 25 minutes to get to the Bikal Port with PHP 30.00 fare each. 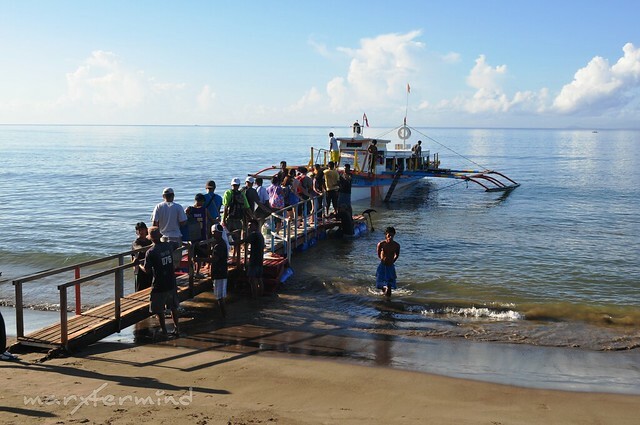 At the Bikal port, we paid PHP 30.00 for Caramoan environmental fee. We were surprised that the port looked like a port of mud! It was not a seaport during low tide. I can’t believe that there are muds under the sea. So we need to ride a small banca for us to get to our boat. We paid PHP 180 for the banca. At last, we came to our boat safe! It was already 11:30 AM when we started the island hopping. So moving on, before the tide gets high, our boatman take us to Manlawi Island. From port, it was 1 hour to get to Manlawi Island. 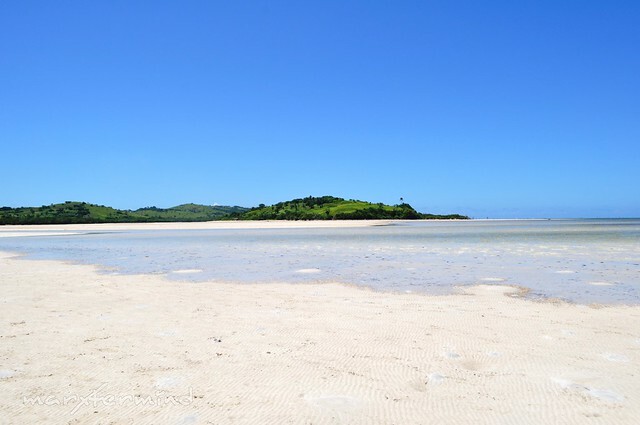 It’s a must to visit the island while it was low tide as the vast sand bar is visible during that time. It was the finest and most astounding sand bar I’ve ever seen, the vast fine sand. 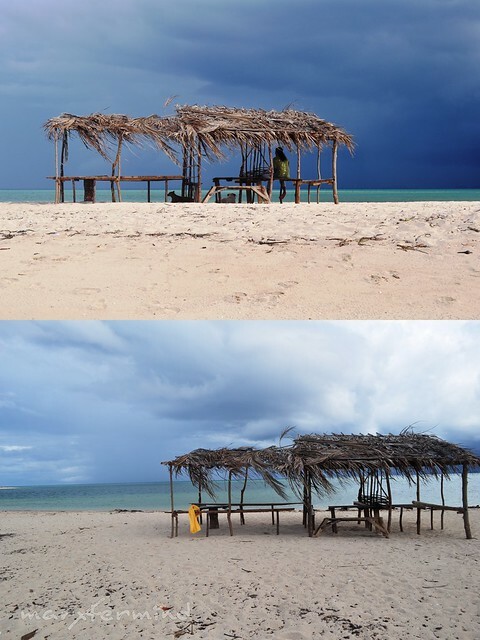 As time goes by, the tide is getting higher and the sand bar is getting smaller. So we’ve decided to go back so we can move on to the next island. After a while, umahon na kami. We moved on to the next island. 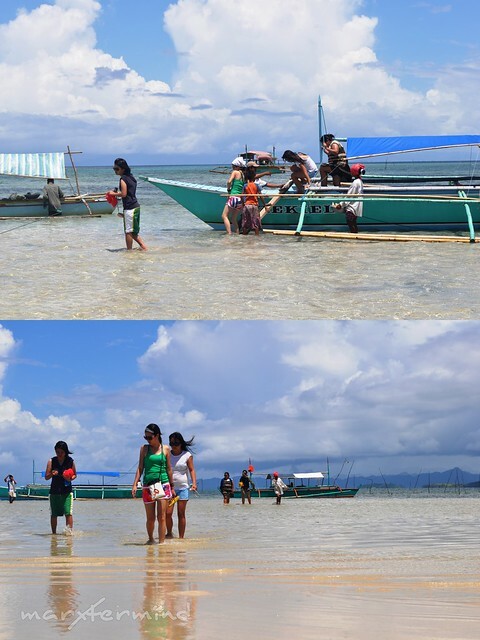 So all of us jumped off from the boat and enjoyed the beach of Bugtong Island. There are big rocks on the side of the island but we didn’t take time to go there anymore because we’re scared and we’re too far from the shore. By the way, did I mention that we are the only persons there at that time? Yey, beach, beach, beach! After a while, we went back to our boat and moved on to the next island. Before there was a small sand bar or shore that connects the island to the other, so one can trek to the light house from the Cotivas Island. 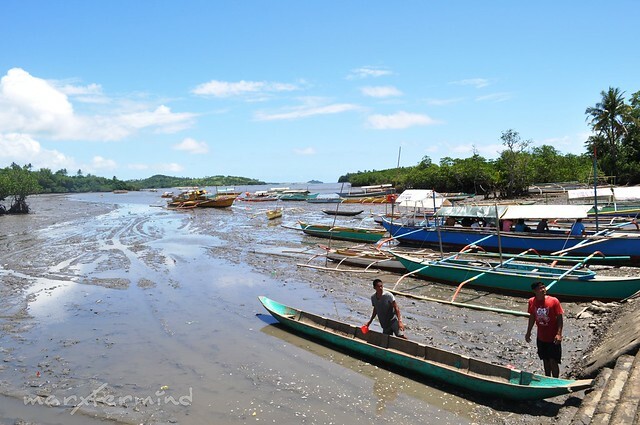 According to our boatman, the small portion of shore or sand bar was destroyed by typhoon. 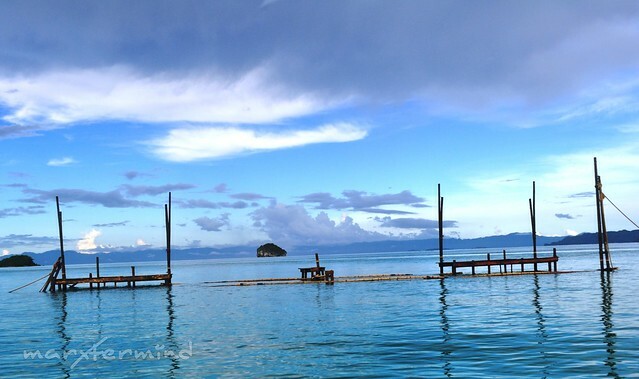 Cotivas Island is just like a typical island with nipa hut stands alone in the middle. 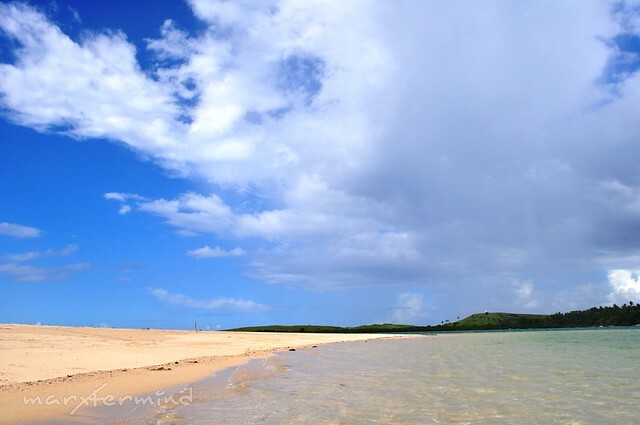 There’s a fee of PHP 50.00 per group when you visit the island. The shore is at the side part of the island, and there were trees and unfrequented place on the other part. The water was hot while the sky became gloomy. There’s a heavy rain coming. I took a dip for a few minutes just to experience how it was. As long as I wanted to explore the other part of the island, we don’t have time anymore as it was already 3:00 PM and we still have one island and grotto to visit. So we went back to our boat and left the island. 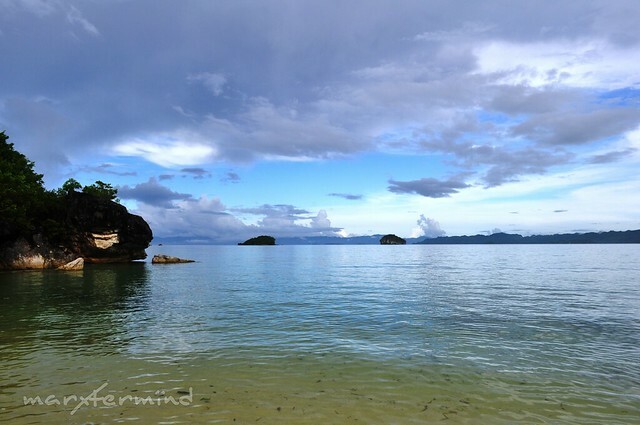 From Cotivas Island, we headed straight (kami na ang sumalubong sa malakas na ulan). A heavy rain was along our way, and we were unprepared. The waves became bigger, yet we let ourselves calm and easy! After awhile, there’s the sun again – we were able to surpass it! Thank God! 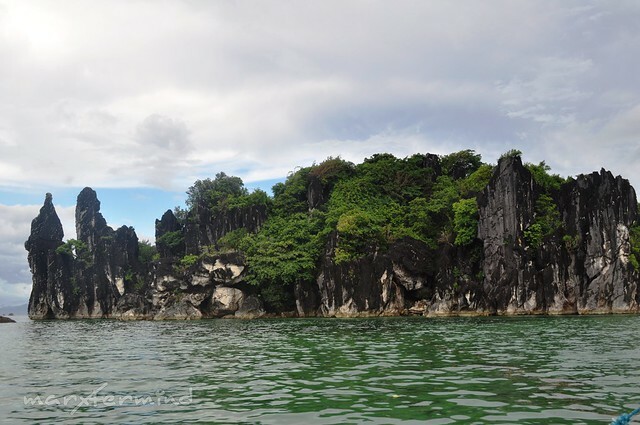 The island is known for its coral reef and rock formation. As soon as we docked, parang pagod na ako and wala ng energy pero go pa rin! I didn’t swim anymore kasi ayoko ng ma-basa! Since it was already high tide, we weren’t able to go to the farthest rock formation. Ganda pa naman sanang photo ops. Nagsettle na lang kami sa malapit sa shore. We explored the island. The island has a short shore line since it was already high tide. There are few people in the island exploring as well. Same with Cotivas Beach, the water is also hot. Nagtampisaw lang! And here’s the view if you of the other side of the island. 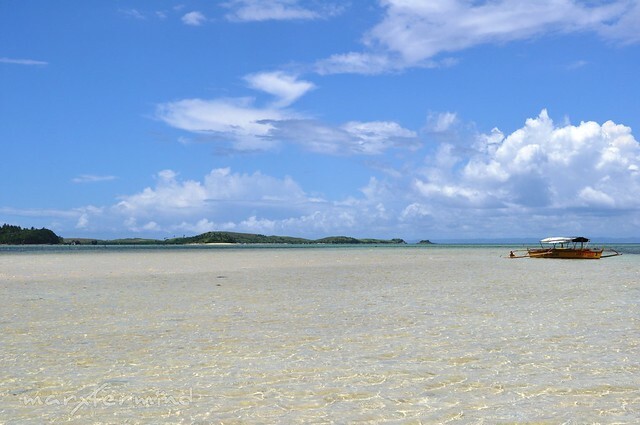 The sea of Caramoan Peninsula is really peaceful, indeed. After a while, we’ve decided to move on to our next destination, the 500+ steps to Grotto (next post na lang)! As we sailed back, we were able to pass by this structure used by Survivor. Overall, I had fun with trip. I waited for so long for this to happen. I asked my relatives to come with me 2 years ago and imagine how long it was until it happened. 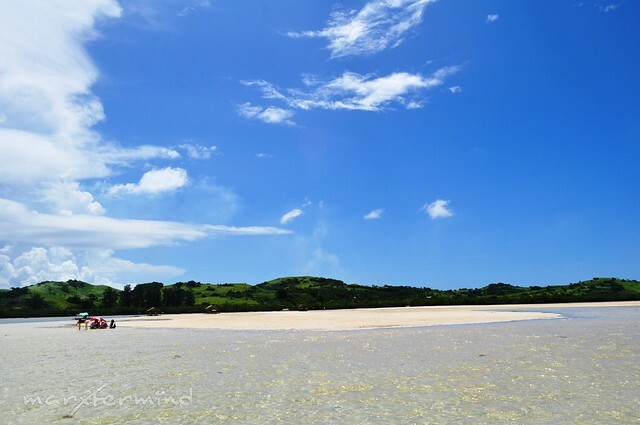 If you’re planning to go to Caramoan by plane, select Manila to Virac flight because Catanduanes is just 45 minutes away from Caramoan. It’s nearer than choosing Naga airport. 2500 per person po ba or the whole boat na? 2,500 per person po ba yung island hopping or for the whole boat na po yun? 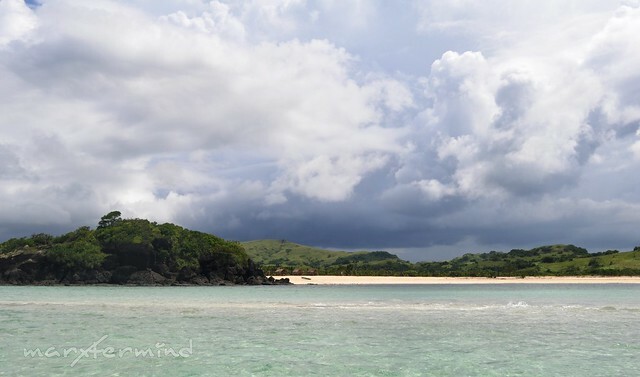 This entry really deserves a 2nd look… Caramoan is the next big thing Philippine tourism! wow! 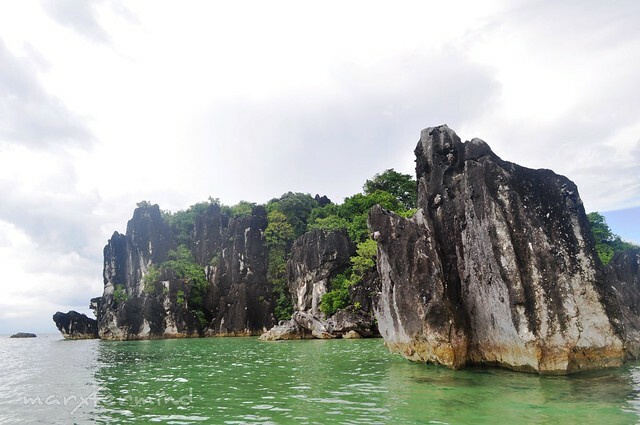 parang palawan yung rock formations. Gusto ko talaga makarating sa island ng walang ibang tao. ikaw na! ikaw na talaga. Uber dami mo ng napuntahan. Great pix as usual.